Product prices and availability are accurate as of 2019-04-14 10:38:05 EDT and are subject to change. Any price and availability information displayed on http://www.amazon.com/ at the time of purchase will apply to the purchase of this product. Yikes! Germs are everywhere-countertops, bathrooms, door handles, the gym-and who wants to take time out of a busy life to get sick again? Soap and water alone can't kill germs, but ordinary hand sanitizers dry out your hands and may leave an "undesirable" scent. ArtNaturals Hand Sanitizer Set rides to the rescue as the perfect protection against bacteria, viruses and fungus. 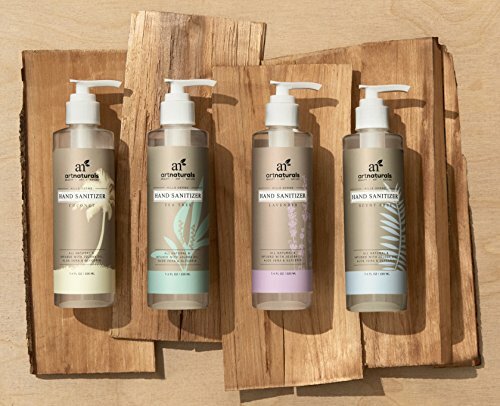 Take your pick of Scent-free, Coconut, Lavender or Tree Tree Oil-all four have the antiseptic, antibacterial, and antifungal power to fight off any germs waiting to pounce, with 99 percent effectiveness. Our organic, quick-dry formula will help protect you against contracting the common cold, flu, and other infections. 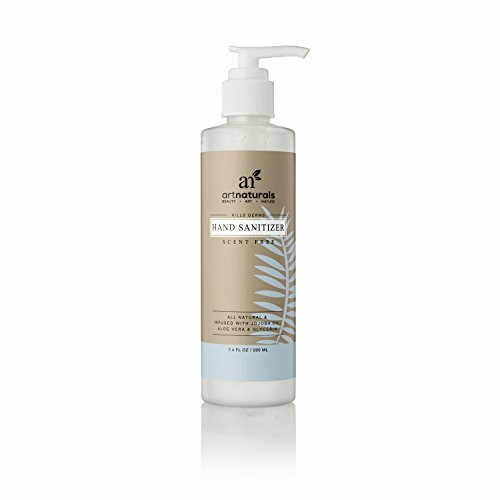 At the same time, the formula's nutrient-rich botanicals, including aloe vera, sunflower seed oil, jojoba oil, multiple fruit extracts, and Vitamin E, moisturize and heal dry, cracked hands. 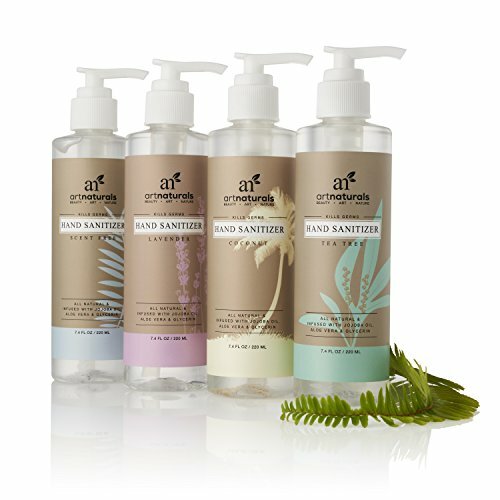 All four hand sanitizers are hypoallergenic and gentle enough for all skin types. 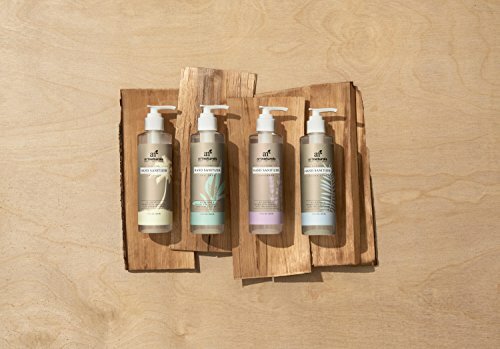 Their light fragrance leave hands freshly scented, adding aromatherapy benefits. Exercise, group work areas and, of course, kids, can bring a lot of unwanted germs back into the house and onto your hands. That's why ArtNaturals Hand Sanitizer Set is ideal for gym enthusiasts, athletes of any kind, those with hands-on jobs, those with communal work areas, parents-or anyone with an active lifestyle. Keep Scent-free, Coconut, Lavender or Tea Tree in your car, in your gym bag, at work-anywhere germs lurk. Make this the season you don't get sick. GERM KILLER: Natural formulas proven to kill 99% of germs, bacteria and fungus when applied to keep you healthy in the most demanding environments. MOISTURIZING: Nutrient-rich formulas also moisturize and protect, rather than drying out hands, they are sensitive skin. GENTLE ON SENSITIVE SKIN: Ideal for gym enthusiasts, those with hands-on jobs, those with communal work areas, and parents. This formula leaves skin feeling soft and it won't sting cuts. GIFT SET: ArtNaturals Hand Sanitizer Gift Set includes four 7.4 Fl Oz. bottles: Scent-Free, Coconut, Lavender and Tea Tree Oil. NATURAL AND SATISFACTION GAURANTEED: At ArtNaturals we don't believe in any of that nasty chemicals you find in conventional sanitizers. Enjoy this product with a 100% satisfaction guarantee.